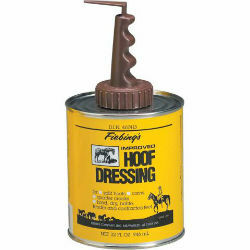 A liquid hoof dressing compounded from the purest of materials to keep hooves in excellent condition. For use as an aid in the treatment of split hoofs, corns, quarter cracks, hard, dry, brittle, tender and contracted feet. May also be used regularly to maintain healthy feet, and to improve hoof appearance. Wash the hoof thoroughly. Apply the dressing with a brush and work well into the edge of the hair (coronet) and frog. For the best results, use two (2) or three (3) times a week. Mineral oil, soyoil, gilsonite, and less than 1% cresol complex added as a preservative.